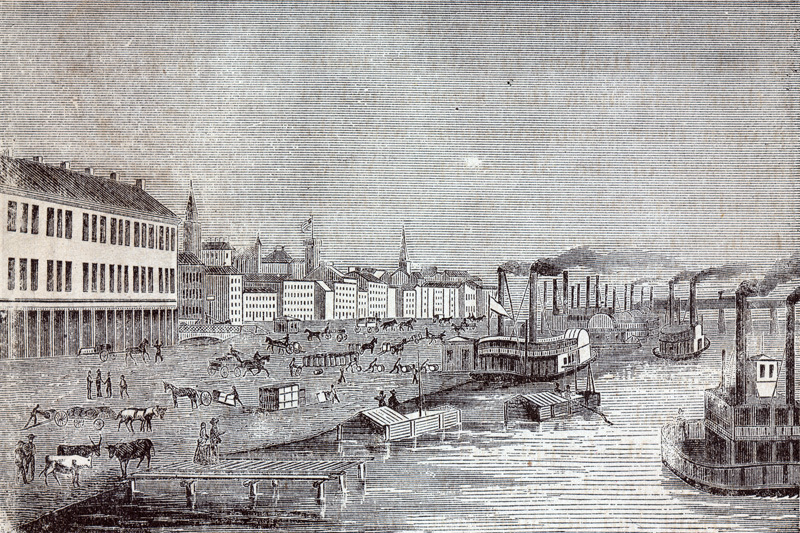 Louisville waterfront a long, long time ago. By now, you should know we are fans of the 8664.org proposal. If you ask us, it just makes too much sense, saves too much money, and steers Louisville’s future growth in a direction that would provide for a real urban, vibrant, and livable city. But as we continue down the road of outdated 20th century planning, we’re more and more going to be associated with mega-mistakes of the past. We’ve been compiling a set of links that demonstrate some of the reasons 8664.org is the right way to go. The issues surrounding such a massive idea are diverse and complicated, so it takes a lot to get through. We highly recommend you check out an article by the Urbanophile about 8664.org, as well, for background, commentary, and convincing arguments. You can see our previous coverage of this issue here. Each article linked below is worthwhile and expands on the point we’re trying to make. We’re driving less. Countless studies have shown that Americans are traveling fewer miles, especially in the face of the economic downturn. Yet research indicates that reductions in driving go beyond erratic gas prices and the economy. According to one computer model taking those two factors into account, driving in America was still projected to increase 9 percent last January. Models without gas or the economy as factors would likely have been even higher. One of the assumptions of the Bridges Project is that driving will steadily increase. In fact, vehicle miles travelled last January dropped 8 percent. The recession will end, but the price of gasoline is expected to continue to climb. A division of the U.S. Department of Energy recently released a journal suggesting that energy supplies won’t be able to keep up with world demand. Everyone is, by now, accustomed to reading about the daily nickel fluctuations of prices at the pump, but it’s only a matter of time before prices climb back to $3–4 per gallon or higher. That will profoundly change the way we use our roads and our city. The study shows that we’re in line with our peer cities in terms of congestion, ranking similarly to Nashville, Indianapolis, Minneapolis, and Portland, and Austin in annual hours of congestion delay. The C-J, of course, asked for input from local transportation advocates including the pro-Bridges Project forces without consulting 8664.org. Further, the Federal Highway Trust Fund that supports highway building will run out of money for the second time in a year sometime this month. Experts are predicting the same thing to happen next year as well. It’s estimated by many including the Obama administration that an emergency $20 Billion stop-gap measure will be needed to shore up the fund. Yet no one has been talking about how to maintain the huge concrete tangle we would otherwise call a waterfront. Freeways aren’t free; they are government subsidies. When we drive on them, many tiny externalities add up to impose quite a large cost to the public. That takes on the form of repaving, accidents, bridge repair, and, I shudder to say, bridge painting among others. And did you know those fancy electronic tolls that are propped up as the only way to get the thing built are really quite expensive? A professor at the Massachusetts Institute of Technology suggests in a new study that “electronic tolling results in rates that are 20 percent to 40 percent higher than they otherwise would be.” The researcher points out that as the tolling mechanism becomes less visible, the easier it is to raise toll prices. It’s really bad for the environment. Louisville is situated in a valley, and the logical low spot in that valley lies along the river. This geographic phenomenon can create problematic air pollution that risks the health of every Louisvillian. The American Lung Association gives Louisville an “F” for our air quality and we’re seeing increased numbers of Air Quality Alert days when our local air is so bad that the government urges citizens to stay indoors. It’s even worse if you live near the thing, and with the confluence of highways centered right where we hope more and more people will move (our revitalizing urban neighborhoods), the health effects of these new urban dwellers could be even worse. All so those truckers passing through town get a 30 second view of our skyline. It’s worst for children and teens, but, really, everyone is affected. It’s even worse for the city. You already know what the Bridges Project will do to the Great Lawn and the waterfront. We’ve already gone over how the project doubles the width of Interstate 65 through Downtown and destroys the urban connectivity of our revitalizing neighborhoods. Â But those are just the immediate results of the project. The Census Bureau recently released figures showing that the suburbanization of America is still in full swing. The vastly expanded highway in the middle of Louisville’s urban neighborhoods will only fuel more suburbanization along with more and longer commutes. More correctly, experts are calling the modern trend “exurbanization,” or growth outside of the traditional suburban rings, deemed “sprawl beyond sprawl.” And that’s taking a drastic toll on our countryside. As counties surrounding Louisville and Jefferson County continue to grow, fueled in large part by the highway itself and the easy access to the city it provides, congestion on our roadways will become even worse than we can imagine today. “Induced demand” occurs when you provide a valuable commodity for free and people end up over consuming it. To continue on with the fast food metaphors: “If the government set up a “french fries trust fund” to cook that were then given away for free, they’d soon enough run out of french fries.” Or, remember the shortages of grilled chicken at KFC after it announced a free giveaway on television. Luckily, the inverse is also true, that by reducing capacity, demand is also reduced. By the way, did you know “commute” wasn’t even a noun until 1960? Highway removal works. Removing Interstate 64 from the riverfront, relieving the pressures on Spaghetti Junction, and eliminating the need for a supersized Interstate 65 will solve Louisville’s transportation problems. The masterminds behind 8664.org have provided the numbers and details on how their plan fulfills the same requirements as the Bridges Project. There are examples of numerous highway removal projects that have drastically transformed their cities and left highway engineers baffled by their success. And when you look around the country, you can see highway removal isn’t really that radical an idea after all. Dozens of progressive cities are talking highway removal. It saves money and increases quality of life. The evidence it out there. All there is to do now is to open our leaders’ and neighbors’ eyes to the problems with the Downtown highway and the benefits without it. PBS recently put together an interesting special comparing Denver, CO and Portland, OR discussing many of the same issues we’re dealing with. It puts the choice in perspective as to what each direction of the fork in the road could lead to. Will we take to the streets to educate our neighbors, calling out “12 lane, insane!” like they just did in Portland over a proposed new bridge? We’ll need to do something to get the word out. Speaking of the benefits of 8664.org, here’s the latest video rendering of the new boulevard along the riverfront. The whole Ohio River Bridges Project just makes me sick to my stomach. This project tells you all you need to know about Louisville and the powers that be. We are a city that is constantly 20 years behind the times and no matter how hard some of us might try to change that, the folks at City Hall, GLI and the CJ are always there to make sure that we don’t do something bold and exciting. At a time when both Kentucky and Indiana are flat out broke, with no signs of that changing anytime soon, why are we even contemplating this astronomically expensive project? A year or so ago I got into a pretty comical email exchange with the CJ’s David Hawpe, one of the bridges projects biggest cheerleaders, over the stupidity of the whole project. I argued that by the time the damn thing was finished that gasoline would be so damn expensive that I just couldn’t quite figure out who would actually be driving across the damn things. As world oil production approaches an all time peak, driving will increasingly become a luxury that few of us will be able to afford. His counter to this was that he agreed with Thomas “Six Months” Friedmans belief that the technology fairies would come up with some new fuel for driving by then and that all would be fine. I honestly don’t see how this ever gets built but until it’s officially taken off the list of options, I won’t hold my breath on it. Keep up the good work and somehow, someway we need to let more people she what this monstrosity will look like when finished. To me, the pictures of the final product are the best weapon we have. Tyler Allen for Mayor ! I have written letters to the mayor, council, and governor – my own, not form letters – arguing for the 8664 concept, and, of course, I get form letters in response. The governmental wall is built. The perception is obviously that 8664 is just elitist – or fringe, and it can be ignored. I'm sure the general public feels the same way – because nothing – just bumper stickers and yard signs – has been done to bring them in. Why have there been no TV and print ads with the arguments presented here? A few informational spot ads would get more people involved and educated. I know – it's money. But money has to be out there. Everyone sits around complaining, but no one goes to the public that will be affected. That was a virtuoso post. I like how you sounded the peak oil bell.